On this day, March 14, 2018, Professor Stephen Hawking died at age 76. It was ironically the same month and day as Albert Einstein’s birth. Professor Hawking was diagnosed at age 21 with ALS, commonly know as Lou Gehrig’s disease, but amazingly he lived more than half a century longer with that degenerative motor-neuron disease. His search for understanding the physics of Black Holes—a window into the long-sought union of quantum physics and general relativity—has led to ideas about cosmology that will be explored and debated for many years. My only opportunity to meet Professor Hawking took place just outside his office some twenty years ago at Cambridge University’s Department of Applied Mathematics and Theoretical Physics. The foreboding office was perhaps the most famous in academia globally in that whoever occupied it was the designated Lucasian Professor of Mathematics, an endowed professorship first held by Sir Isaac Newton. I assumed Professor Hawking’s only reason for wanting to meet with me at tea was what I had shared with his nurse: I was a physicist and the business card I handed her was highlighted with U.S. Centers for Disease Control and Prevention. During my time with him he spoke through his speech-generator and indeed wanted to know “what a physicist was doing at the CDC.” I pointed out in my nervousness that one thing “the few of us there are confined to do is work in real rather than imaginary time!” I can still picture that one tiny smile my naïve comment drew out of him. I quickly admitted how, even as a physicist, I was far outside his field and was still struggling with absorbing all that a Brief History of Time had to offer. My one-on-one meeting with Stephen Hawking only lasted a few minutes, but my memory of it is engraved in my mind. 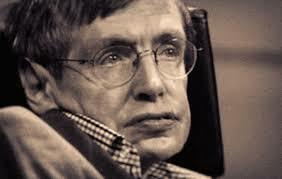 Professor Hawking was not only curious about the Universe and “the mind of God,” but even about individuals who inhabited one miniscule part of the vastness of space-time. Each time I look up at the stars now, I’ll remember Stephen Hawking and that brief encounter that crammed me with enough inspiration to last at least a lifetime. Thank you, Jim, for sharing this memory! What an opportunity to meet such genius. Thanks for commenting, Armin! Certainly one of the highlights of my career as a physicist.